An Herbal Affair makes downtown Sand Springs green this weekend. 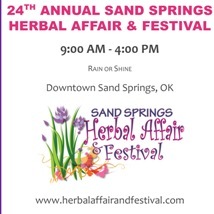 Mark calendars now for the 24th Annual Herbal Affair & Festival April 20, 2013 in the heart of Sand Springs. More than 100 vendors bring herbs, perennials, natives, and heirlooms plants, along with herbal products, gardening supplies and folk art to the heart of Sand Springs, giving visitors a taste of spring fever. Also included are delicious food vendors who served up Amish, Greek, Italian, Cajun, Indian, along with plenty of American cuisine.